Therefore, the question: having an arbitrary number of game field pairs, what is the ideal, most square looking, grid size? 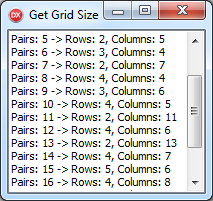 Ideally, if we have (for example) 8 pairs, that is 16 fields, the grid size is 4×4 as the square root of 16 is 4. For 10 pairs, 20 fields, the size would be 4×5. In worst case scenarios, where the number of pairs is a primary number (dividable only by 1 or itself), the grid will always calculate to 2 x numberOfPairs. Here you might want to add another parameter to the function – something like how many dummy/non-playable fields to add to the grid so it looks more square like. I’ll leave this to you.